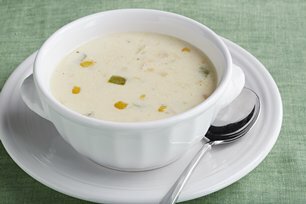 This easy chowder is made with cream cheese and laced with onion, green pepper and cream-style corn. Makes a nice accompaniment for sandwiches. Melt margarine in medium skillet on medium heat. Add green peppers and onions; cook and stir 3 to 5 min. or until crisp-tender. Add cream cheese spread and milk; cook on low heat 3 to 5 min. or until cream cheese spread is completely melted, stirring frequently. Remove from heat. Enjoy a serving of this quick-and-easy soup on a cold winter day.